This easy-to-make recipe is a far cry from my Sito’s tabouli, but requires much less preparation and chopping. Although taking liberties with the classic Middle Eastern salad – and hopefully not offending the omnipotent Tabouli Gods by doing so – I know you won’t be disappointed with this version. I’ve reduced the parsley amounts and replaced the other ingredients with roasted pumpkin seeds and cranberries for a pleasant tartness. I’ve still used bulghur wheat here, but it would taste equally good with couscous or quinoa instead. If my grandmother ever asks, this will be our little secret. Shh. 1. In a medium bowl combine uncooked bulghur and dried cranberries. Add 1 cup boiling water, or enough to just barely cover the wheat. Let stand for 30 minutes until the water has been fully absorbed. If the bulghur is still hard, add a few extra tablespoons of boiling water and wait 10 extra minutes. Fluff mixture with a fork. 2. Roast the pumpkin seeds in frying pan over medium heat, for 5 minutes. Stir constantly and ensure they don’t burn. 3. Stir remaining ingredients, including pumpkin seeds, into bulghur wheat-cranberry mixture and toss. Refrigerate for 30 minutes before serving. 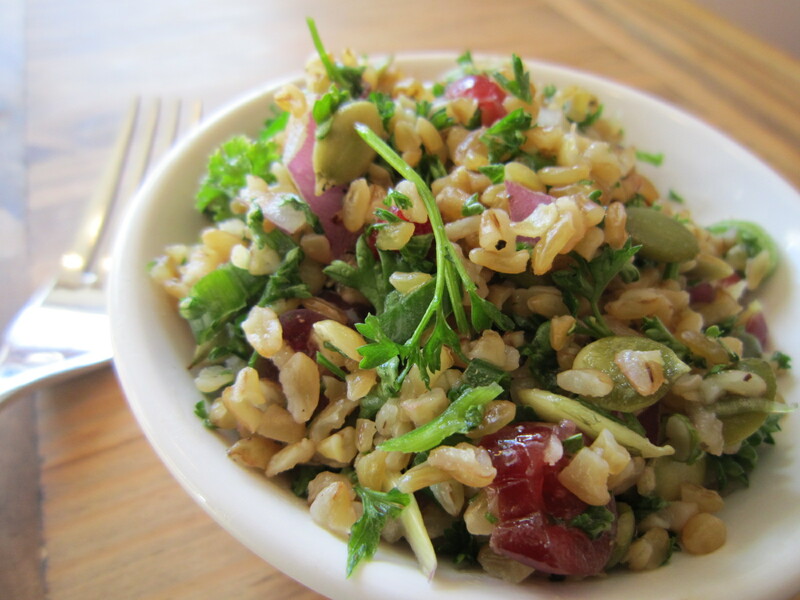 This entry was posted on Saturday, February 19th, 2011 at 3:11 pm	and tagged with bulghur wheat, cranberry, lebanese, middle eastern food, parsley, pumpkin seeds, recipe, Salad, taboui, taboulleh and posted in Appetizers, Lebanese Food, Side Dishes, Soups and Salads, Vegetarian. You can follow any responses to this entry through the RSS 2.0 feed. I like how you describe the recipe… “Tabouli Gods.” It makes perfect sense. You say that you’ve cut the amount of parsley? Why? That’s what makes tabouli tabouli, isn’t it? The bulghur that you’ve used looks like the whole grain, is that right? I’m never sure how to differentiate between bulghur and the various grades or what have you. Thanks for the recipe! This is something that I know that I’d love. 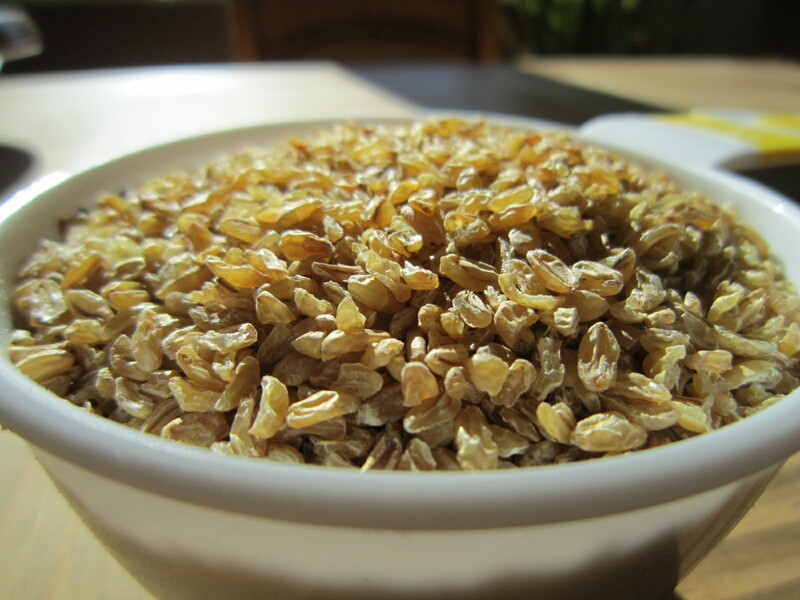 It is the whole grain, you’re right, though health food stores will usually carry different varieties. Couscous or quinoa also lend themselves well to this recipe. I would normally agree with you about the parsley – it does make tabouli ‘tabouli’, but I was going for something different here. Plus, I was running low on parsley.